— even during the worst market conditions we've seen in generations. Of course, we are not promising that if you received and acted upon our recommendations, you'd get a 19.17% return. * That's just our average return so far — in the future, we might make less, or we might make more. Flash Alerts e-mailed to you immediately whenever a new trade recommendation is issued (usually several times per month). That's over a $400 savings, a 40% discount! These deep special subscription discounts and special bonus offers are ONLY available when YOU ORDER NOW or CALL our offices! You must be delighted with the Gold and Energy Advisor service or you won’t pay a penny. If you wish to cancel, simply call Subscriber Services (1-800-819-8693) within 60 days for a full refund. Past performance is no guarantee of future success. This offer is strictly limited to U.S. residents ONLY. 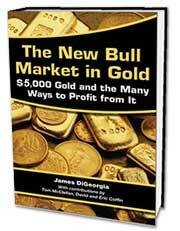 The Gold and Energy Advisor is published by Finest Known, LLC. As a publisher of a financial newsletter of general and regular circulation, we cannot tender individual investment advice. Only a registered broker or investment advisor may advise you individually on the suitability and performance of your portfolio or specific investments. The editor, publisher, and directors of The Gold and Energy Advisor flatly promise no front-running. We will not initiate a position in any stock we have recommended for 10 business days before our original recommendation and 10 business days after any subsequent recommendation. Anyone who does is fired immediately. We love the securities we recommend and we can not wait to invest in them ourselves but YOU ALWAYS COME FIRST. There is a very high degree of risk involved in trading. Past results are not indicative of future returns. The Gold and Energy Advisor and all individuals affiliated with The Gold and Energy Advisor assume no responsibilities for your trading and investment results. Gold and Energy Advisor offers an unconditional 60 day guarantee. During the initial 60 day period of your subscription, if you wish to cancel for any reason whatsoever, you will receive a full refund. Automatic Billing: By providing your credit card information to Gold and Energy Advisor , you agree that charges will be billed to your credit card for the applicable pricing plan you chose. Advance automated billing to your credit card will occur on a monthly or yearly cycle (depending on the term you have chosen) on the anniversary of the initial set-up and activation date unless other arrangements have been contractually arranged. You may cancel your subscription at anytime without incurring further credit card charges. If you need assistance with customer service, such as questions regarding your subscription or need to change your address, change or cancel your subscription, simply contact our Gold and Energy Advisor Customer Service Department by telephone at 1-800-819-8693 or 1-561-750-2030, Monday through Friday between the hours of 8:00a.m. and 8:00p.m. 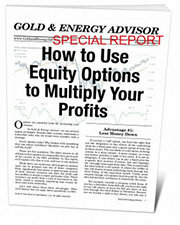 EST or send an e-mail to: customerservice@goldandenergyadvisor.com. All cancellations will take effect immediately and you will receive a confirmation e-mail from us. Call one of the numbers below to have your questions answered and subscribe by phone. ** All Bonus Books and Special Reports will be sent by email.